As many of you know, we are investors in a Strip-view 1-bdr at Panorama Towers, which stands on the west side of I-15 across from CityCenter. I've several times on this blog offered photo progress reports on the now-$11.2 billion project from MGM Mirage. You can see an aggregate of those earlier images here. The reason I haven't been able to provide more frequent updates on this score is that we miraculously rented the money pit out in April 2008. And, predictably, it was to a turd who has now decided he doesn't want to stay. Fortunately, rather than disappear on us, he found someone else to move in immediately and sign a new lease, so the damage was minimal. But I did use this interim moment to go see what damage the turd did to our place -- surprisingly, none -- and to shoot some new images. The top photo above is the broader view. Below is a direct-view look at the back of Aria with Vdara to the left. I assume the circles in the ground will be swimming pools? The one below that was from April 2008. I think this, below, is a parking garage. I know the brown square all the way to the right is the power plant. Hey, maybe my new renter will be a deadbeat, too, and then I'll get to go back and shoot some more!!! We can only hope. James Haug of the Review-Journal has an incredibly entertaining piece in yesterday's paper about a functionally illiterate school board candidate -- endorsed by the teacher's union no less! -- whose website was riddled with misspellings, bad grammar and a few other missteps we usually don't sanction in people in charge of major educational institutions. The candidate, Deanna Wright, seems utterly baffled as to why this is a problem and surely feels she's being picked on by the newspaper. I disagree; serviceable writing ability seems like a reasonable prerequisite to becoming a trustee of a multibillion-dollar operation, don't you think? Read it here and decide for yourself. The R-J wisely saved a pdf of the site and houses it with the story so that it could live on after the candidate fixed it, which she has done. Even so, Wright's site is worth checking out anyway for its sheer lameness. I'm particularly fond of her opening Flash screen. It's admirable that she wants to get involved, but that's what the PTA is for. And hey, if she plays her cards right someday she could be on the Republican presidential ticket. Ya never know. To enroll you're childeren in kunderfarden, it is improtant and nessary to bring a coppy of a utility bull, even in outlaying areas. Or so read the World Wide Web sites of the Clark County School District, which included those misspellings and dozens of others in instructions for how to register for school and how to interest children in reading. It was so appalling that the mom decided to find the money to put her kid in private school. Good call. Kind of cute, though, to see how we wrote about the Internet as this newfangled thingie a scant 11 years ago. It's Donny & Marie Day! No, really! Mayor Oscar Goodman declared it. Here's Donny & Marie accepting the proclamation from Flaming-O resort prez Don Marrandino, whom I caught singing along out loud as Donny crooned "Soldier of Love." As you can tell, I attended the media opening tonight for the new D&M show at the Flamingo. I'll discuss it more on the next episode of "The Strip," but if you're really curious I sort of live-blogged the show and the meet-n-greet via my Twitter account from about 7-10 p.m. today (9/25). ...and so now I can die a happy man. Or something. My god that woman looks great, doesn't she? I wrote a piece for the New York Times about the Faux-J Room, complete with an estimate from the local Home Depot on what it may have cost since the DA won't say until the trial's over. Check it out here. And here's a fun shot of me and Dominick Dunne in the fake Palace Station room. And with that, I believe, I've ridden my Dominick Dunne horse about as far as I can. Time to move on to other things. OK, everyone. He comes Dominick Dunne: The Strip Interview, featuring one of my favorite Steve Wynn stories ever plus thoughts from Dunne on his health, O.J. Simpson, his late brother John Gregory Dunne and the McCain-Palin ticket. Click on the date to hear it or right-click to download the show and listen whenever you want. Or subscribe via iTunes here or via Zune here. If O.J. Simpson is on trial, then Dominick Dunne must be in town. The ailing Vanity Fair columnist and CourtTV personality, legendary for chronicling the intersection of celebrity and the criminal justice system, ignored doctor’s orders and his family’s wishes to descend on Las Vegas for the trial of, well, the month. He's had challenges -- he left court ill on Monday but returned Tuesday -- but his reward has been the warm embrace of Las Vegas high society, such as it is, and a loving New York Times profile rendered by none other than your Strip co-host, Steve. Dunne, an accomplished novelist and Hollywood producer in addition to his career observing the high-profile trials, opens up this hour about his health and why this is his final trial, what the difference between Britney Spears and Zsa Zsa Gabor is and whether John McCain is too old to be president. Plus, he tells one of the greatest Steve Wynn anecdotes of all time. In Banter: Why Aria's great food line up is disappointing, the Venetian funk spreads and the fake OJ crime scene. Here's this week's column for the Las Vegas Weekly. Enjoy. How a famous writer taught me to savor my O.J. As recently as 10 days ago, I was just like most of you out there. I had absolutely, positively, 100 percent no interest in whatever tawdry affair would unfold in a criminal trial that was news solely because it involved one Orenthal James Simpson. Heck, I can go one further. I wasn’t just indifferent; I was actively resentful that I was about to have to turn over my career and life—in the middle of the most fascinating election of our time, no less—to sit in a courtroom for weeks just because this maniac took some screwy characters on a misadventure in search of some keepsakes. And I felt the lash of condescension—and thought I deserved it—from Review-Journal columnist Jane Ann Morrison when she explained her disdain not just for the topic but even for the journalists documenting it. Then I met Dominick Dunne, and I fell in love with this story. I don’t expect any of you to take more interest in what’s taking place on the 15th floor of the Regional Justice Center right now. I understand why you may be repelled. And I don’t pretend that it has the broad societal significance of, say, Jane Ann’s series on naming her kitten. But my assigned seat in the courtroom is beside that of the diminutive white-haired man with the Coke-bottle glasses, a latter-day (and heterosexual) Truman Capote who feeds anecdotes and observations about such events to high society via his monthly pieces in Vanity Fair and his TruTV appearances. That was a bizarre glitch of fate, because the night before I met him, I had read Dunne’s latest column. In it, per the occasion of Vanity Fair’s 25th anniversary, he reflected on his career as a film producer, on his turn toward journalism at 50 after his daughter’s murder, about being in the thick of the trials of Claus von Bulow, William Kennedy Smith, the Menendez brothers, Phil Spector and, of course, O.J. Simpson. Alongside this piece, VF ran the classic photo of Simpson at his 1995 murder trial trying on that glove—you know, “if it doesn’t fit, you must acquit”—with a riveted Dunne as the most distinctive presence in the audience. Here’s the last line, the last thing I read before turning off the lights on September 14: “What a swell party it’s been. Next, it’s off to Las Vegas for O. J. Simpson’s trial for armed robbery and kidnapping.” The next morning, I entered the courtroom to sit down, and, holy cow, there he was! Oh, wait. That's right. We broke that story 6 hours earlier. And the action of the judge? That was yesterday. For shame. Whenever I pick up a story from the R-J, I credit it appropriately. Why don't they feel the same obligation to other outlets? I'm typing from inside Courtroom 14C where the Plaza v Plaza case over whether the Elad group may use the name for their property across from Wynn Las Vegas and who would be on the stand by Dave Schwartz from the Center for Gaming Studies at UNLV and the Vegas Gang podcast. Having sat through days of very grim OJ witnesses being beaten up from every side, the thing that strikes me most is that Dave looks like he's having a terrific time up here. Schwartz has established his credentials here as a gaming historian by holding up his various books for the jury. If he were smart, he would've pulled an Oprah and left one of each under each juror's chair! My favorite, incidentally, is Suburban Xanadu. I highly recommend it, although I cannot imagine why it's priced so high by Amazon.Com. As I write, Dave is being shown a litany of advertisements from various periodicals over the years proving that the Plaza Hotel-Casino in downtown Vegas owned by Tamares Group has been going by some variation of Plaza for decades. He is, however, testifying for the DEFENSE that the Plaza has used variations of Plaza -- including the Union Plaza -- and thus they have not consistently used the trademark throughout their history. UPDATE: The Tamares Group is now grilling Schwartz because for many years there have been large neon signs that just said "Plaza Hotel." Schwartz says the place was still commonly known as Union Plaza (see left) because of a huge looming marquee that said so. 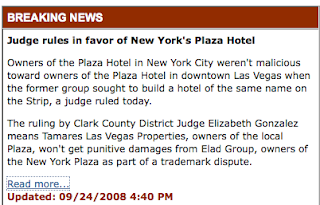 The lawyer also pointed to this piece Schwartz did for the Las Vegas Business Press in which the lawyer asserted Schwartz sided with the owners of the NYC edition of the Plaza as evidence he's a biased witness. 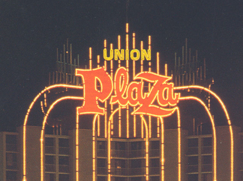 It's worth noting, by the by, that a Google search of "Union Plaza" yields as its first entry ... the Plaza Hotel and Casino. More weirdness in OJville - A book deal during lunch?!? During the lunch break, I introduced myself in the cafeteria to Walter Alexander, one of the four guys who took pleas in the OJ case and one of the five who joined Simpson in his raid of the Palace Station Hotel room. Alexander and his attorney, Robert Rentzer, were having lunch. Alexander asked me if I knew any book agents. I was confused but I said, sure, I know some. Alexander says, "Hey, after this is over, maybe you and me, we could work on a book together?" I was a little stunned since the guy was in the smack-dab middle of testifying and the defense was sure to attack him as a shameless profiteer. Rentzer also heard alarm bells. He scolded his client to focus instead on his testimony. Very, very odd. Also, I can't imagine anyone buying that book. But that's a whole other matter. One floor below OJville, today marks the seventh day of testimony in the trial of Tamares Group v Elad over the use of the name Plaza Hotel. 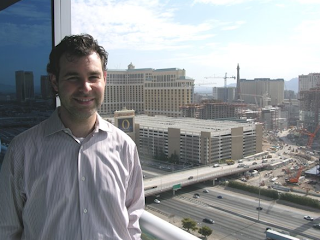 Elad owns the New York City version of the Plaza and has plans to build a $5 billion Plaza on the former site of the New Frontier across from Wynn Las Vegas. Tamares owns the Plaza Hotel-Casino in downtown Las Vegas, which has gone by that name for 37 years. So far all the good news has gone to Elad. Tamares had three complaints and two of them have been tossed. The judge threw out one, that Elad had engaged in deceptive business practices, before the trial started. Yesterday, she also tossed Tamares' claims for punitive damages. The jury will still get to decide the central question: Who gets to use the name in Vegas. Expect a verdict late next week. Oh, and a spokesman for Elad insisted to me that they will start building on the property in spring 2010. I'll believe that when I see it and even then, I may not believe it. OK, OK. It's not a scandal. In fact, it's really kind of stupid. But still, it ticked me off and that's what blogs are for, yes? So here's my question: Is it legal to advertise for a product that DOESN'T EXIST? I tore this thing out of the Review-Journal the other day figuring that I'm up early these days going to OJville and all, so maybe I can stop and try out the 7-11 iced coffee thing. 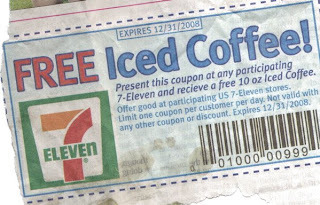 Except that I went to four 7-11s (the first two in search of this, the third and fourth because I had to know) and nobody would take this coupon. Why? Well, 7-11 does not have a 10 ounce cup of, from what I could tell, ANYTHING. It's a farce. They put a quantity on their coupon that would entice people to come in assuming that once they were there, they'd say, "Oh, OK, give me the big one." Or something. THE STRIP IS LIVE TONIGHT WITH DOMINICK DUNNE! Vanity Fair columnist and celeb-justice legend Dominick Dunne is this week's guest on "The Strip," and we'll play parts of my conversation with him recorded Sunday -- the day before he fell ill at the OJ trial in Vegas -- on tonight's live broadcast of our show. The entire discussion will be included in the podcast version which will be up by Wednesday morning this time owing to the breaking news about Dunne and his health. It's a terrific interview in which he tells one of the very, very best Steve Wynn anecdotes I've ever heard. I've made sure that that is part of what we do play during the live broadcast. For background on Dunne, read my Styles piece from Sunday's New York Times here. Join us 7-8 pm PT at LVROCKS.COM for the broadcast and live chatroom. Or wait and get the podcast. Or both. Your call. The Clark County District Attorney's office refuses to release the cost of constructing the fake OJ crime scene photographed here until after Simpson's trial is over. Anyone know a credible carpenter who can look at the photos and give me an estimate? I won't award anyone the winner of the contest until I get an official answer, but for other purposes I do need some ballpark estimates so e-mail me at TheStripPodcast[at]aol.com if you are a carpenter or know one who will look at give me an idea. ...remains open until I find out what it cost or until someone else reports the answer. So those of you who haven't e-mail me a guess at TheStripPodcast[at]aol.com, please do so whenever you want. If you enter too late, I'll let you know. Doesn't hurt to try, tho. Find out what I'm talking about here. My piece on Dominick Dunne's presence in Vegas is on the cover of the Sunday Styles section of The New York Times. It's one of my favorite pieces of recent memory. Read it here. In advance of the trial, I interviewed several defense attorneys and asked them what they would look for in an OJ Jury. One said off-record, "I'd be looking for people who were unconscious." SNL, evidently, thought up that very idea 10 days AFTER the jury was seated in just four days. Hmm. Their stand-in for Jackie Glass was OK, except that she didn't really go off on any shrill tangents attacking the lawyers for, uh, doing their jobs. Oh well.